The genome of Rhodococcus sp. strain RHA1, a very potent biphenyl and PCB degrader, comprises a total of 9.7 Mb and consists of the 7.8-Mb chromosome and three linear plasmids pRHL1, pRHL2, and pRHL3 (McLeod et al. 2006; www.rhodococcus.ca). Genome analysis indicated that the three linear plasmids carry 11 of the 26 peripheral aromatic degradation pathways of strain RHA1, suggesting that they have a significant catabolic role and may serve as reservoirs for catabolic functions (McLeod et al. 2006). Plasmid pRHL3 was predicted to contain three P450 monooxygenase genes, as well as a gene cluster coding for putative aromatic ring dioxygenase, dehydrogenase, and intradiol dioxygenase enzymes that may be involved in oxidation and degradation of aromatic compounds (RHL3.277-3.281). Products of further putative catabolic genes may contribute to glucose metabolism. Two ORFs (RHL3.41 and RHL3.42) presumed to encode a carveol dehydrogenase and a limonene monooxygenase are clustered together with a series of dehydro-genase genes. Therefore, it has been suggested that the physiological role of pRHL3 is to increase the catabolic capabilities of strain RHA1 (Warren et al. 2004). For the two other linear plasmids of strain RHA1, their role in catabolism, especially in the degradation of biphenyl/PCBs, has been established fairly well. Strain RHA1 besides biphenyl (Fig. 4) utilizes isopropylbenzene, ethyl-benzene, and other monocyclic aromatic compounds (Gon^alves et al. 2006). Biphenyl, isopropylbenzene, and ethylbenzene degradation proceed via analogous reactions, i.e., initial aromatic ring dioxygenation, rearomatization of the cis-dihydrodiol to form a dihydroxy aromatic compound, and subsequent meta ring cleavage and C-C hydrolysis. Strain RHA1 is a prime example for illustrating the metabolic redundancy of rhodococci, as it contains multiple genes for various degradative steps, distributed on the linear plasmids pRHLl and pRHL2 and the chromosome (Table 1 lists the catabolic genes identified on the plasmids). However, especially in the case of homologous proteins showing relatively low sequence identities, such multiple "isofunctional" enzymes may well have evolved distinct specificities for different sets of substrates (Gon^alves et al. 2006; McLeod et al. 2006). Even highly similar proteins may show subtle differences in their substrate preferences, as observed for EtbD1 (of pRHL1) and EtbD2 (of pRHL2), which share 97% sequence identity. Both enzymes have been characterized as 2-hydroxy-6-oxohepta-2,4-dienoate hydrolases with low activity toward 2-hydroxy-6-oxophenylhexa-2,4-dienoate (the substrate of BphD), but EtbD2 and EtbD1 convert the latter compound with 11 and 3.3% relative activity, respectively (Yamada et al. 1998). Notably, the expression of both etbDl and etbD2 is upregulated by ethylbenzene as well as biphenyl (Gon^alves et al. 2006), suggesting a physiological role in both catabolic branches. With respect to the initial step of biphenyl degradation, expression of all sets of ring hydroxylating dioxygenase genes (bphA, etbAl, etbA2) likewise is induced by biphenyl, and gene disruption experiments suggested that all these genes are involved in biphenyl degradation (Takeda et al. 2004; Iwasaki et al. 2006; Gon^alves et al. 2006). Two cis-dihydrodiol dehydrogenases BphB1 and BphB2, which are encoded on pRHL1 and pRHL2, respectively, catalyze the second step in biphenyl catabolism, i.e., the rearomatization of the cis-dihydrodiol to form 2,3-dihydroxybiphenyl. An abundant variety of genes exist for extradiol ring cleavage dioxygenases (bphC genes, etbC on pRHL2); the EtbC protein shows broad specificity toward 2,3-dihydroxybiphenyl and methylcatechols (Hauschild et al. 1996). The gene bphCl is found on pRHL1, whereas bphC3, C5, C6, C8, C9, C10, and Cll are chromosomally encoded. In the fourth step of the biphenyl pathway, at least two hydrolases cleave 2-hydroxy-6-oxophenylhexa-2,4-dienoate (gene products of bphDl of pRHL1, bphD2 located on the chromosome, and possibly etbD2 of pRHL2). Overall, the transcriptome of strain RHA1 grown on biphenyl and ethylbenzene suggests that at least in this strain, the concept of redundancy not only refers to gene loci, but also to patterns of gene expression and synthesis of catabolic (iso)enzymes (www.rhodococcus.ca; Gon^alves et al. 2006). The cooperative involvement of multiple enzymes with distinct but overlapping substrate specificities may be a crucial determinant for the superior capability of strain RHA1 to degrade a series of PCB congeners. 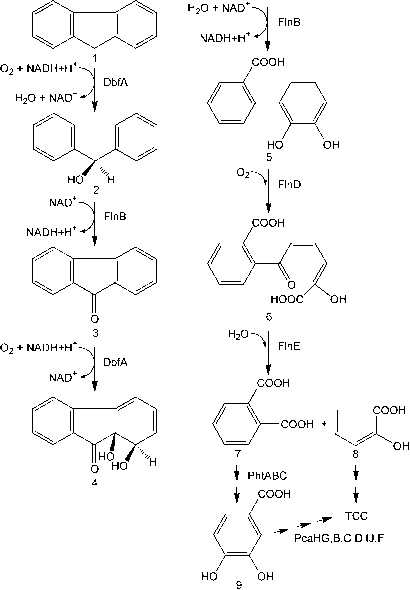 The downstream degradation of the 2-hydroxypenta-2,4-dienoate intermediate produced by meta ring cleavage and C-C hydrolysis in biphenyl and ethylbenzene degradation (Fig. 4) is catalyzed by gene products of the bphE, bphF, and bphG genes located on pRHLl and pRHL2 (Table 1) (Sakai et al. 2003; Gon^alves et al. 2006). 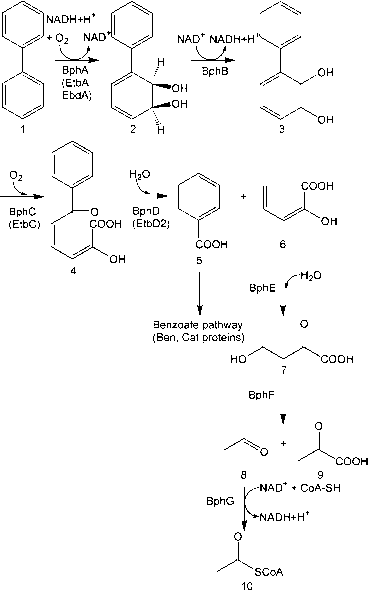 In contrast, the benABCDK cluster for the degradation of benzoate, the other product of BphD-catalyzed hydrolysis of 2-hydroxy-6-oxophenylhexa-2,4-dienoate (Fig. 4), are located on the chromosome (Kitagawa et al. 2001; www.rhodococcus.ca). Benzoate is degraded via catechol; degradation of the latter likewise is encoded on the chromosome (cat gene cluster). Expression of the ben and cat genes is induced by biphenyl and benzoate (Gon^alves et al. 2006). Strain RHA1 utilizes phthalate via protocatechuate; however, the proteins involved in protocatechuate degradation are encoded by the chromosomal pca gene cluster, whereas phthalate conversion is encoded on the two linear plasmids pRHL1 and pRHL2. Two nearly identical pad-pat-tpa gene clusters comprising phthalate degradation genes (pad), genes predicted to be involved in uptake of phthalate (pat), and presumed terephthalate catabolic genes (tpa) are located on both replicons (Table 1). Actually, the pad-pat-tpa gene cluster is part of a 32.1-kb duplication which contains 34 putative ORFs, including genes presumed to code for transposases and an integrase (Patrauchan et al. 2005). In conclusion, the current genomic, transcriptomic, and proteomic data (Patrauchan et al. 2005; Gon^alves et al. 2006; McLeod et al. 2006; www.rhodococcus.ca) suggest that degradation of aromatic compounds by strain RHL1 involves multiple peripheral pathways which are partly, but not exclusively, encoded on its linear plasmids. The intermediates generated are subsequently funneled into a limited set of central (usually chromosomally encoded) pathways that produce TCA cycle intermediates.